Helios Coatings, Inc. is a leading provider to the automotive industry of proprietary, environmentally friendly, metallized and premium paint coatings and other finishes for wheels and other parts. Our focus is primarily coating materials and processes for leading automobile manufacturers (“OEM’s”) and the Tier One wheel manufacturers that provide wheels to the OEM’s. Through the use of a variety of metals in our process, we can customize the hue (tonality) of the metal finish to produce an unlimited number of different metal finishes from dark to light, silver to gold. We can also produce different finishes from high gloss to flat/matte. The primary way an OEM differentiates its products today is through the design of a specific base model and then differentiating that base model with smaller runs of different accessories such as different wheel shapes, trim and colors. These smaller runs of 25,000 to 45,000 vehicles, allows the automaker to test the market with specific looks without financial catastrophe. If the demand for the “look” exceeds supply then it is much easier to order additional vehicles as well as to increase profit margin due to the demand. We are an integral part of this process for OEM’s in developing unique finishes. Our singular focus is for differentiated solutions to our customers’ coatings challenges. We are committed to the interests of our employees, our suppliers and ultimately the consumers who purchase our customers’ vehicles. The balance between the aforementioned interests is a guarantee for producing premium, long lasting and beautiful finishes for our customers. Centrally located in Canton Ohio, we operate an IATF 16949:2016 certified 60,000 square feet, state of the art, automated coatings facility. 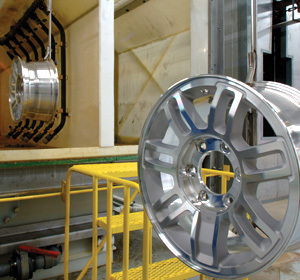 We offer a complete in-house research and development laboratory to seek the optimal application for our customers’ wheels and trim parts while assuring compliance to strict OEM specifications. Our laboratory offers a full complement of OEM approved testing equipment simulating the harshest environments wheels and trim are subjected to over long periods of time. We believe our facility is unique in the industry in its complement of robotics, clean-rooms, processes and staffing industry experience.